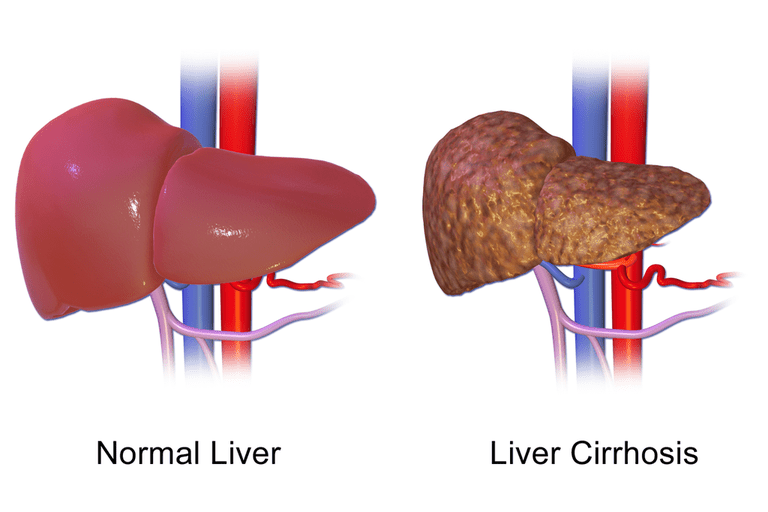 Cirrhosis is a late-stage liver disease characterized by scarring caused by ongoing liver damage. Scarring restricts blood flow to the liver impairing its normal functions. Your liver is responsible for regulating the composition of blood, including the amounts of sugar, protein, and fat that enter the bloodstream. It removes bilirubin, ammonia, and other toxins from the blood. The damage done by cirrhosis is not reversible, but if you receive an early diagnosis, treatment can limit further damage. Unfortunately, you may have no noticeable symptoms in the early stages. Left untreated, your liver may not function as it should, which can lead to liver failure or death. Loss of liver function affects the body in many ways. Early stage liver damage begins as fibrosis and can take years or even decades to manifest into cirrhosis. Once you get cirrhosis you may experience one or a few of the common problems, or complications, caused by cirrhosis. Complications of cirrhosis cause the liver to slow down or stop production of the proteins needed for blood clotting. When you cannot clot properly, you bruise or bleed easily. Fluid retention is common in people with cirrhosis. The portal vein, which carries blood to the liver, gets backed up due to scarring on the liver. This can cause fluid to accumulate in your legs, called edema, and abdomen, also known as ascites. Edema and ascites can also be caused when the liver loses its ability to make the protein albumin. Jaundice is a yellowing of your skin and eyes that occur when the diseased liver does not absorb enough bilirubin. The liver produces bile to aid in the digestion of fats. Bile backups can lead to bile deposits in your skin that may cause intense itching. You can develop gallstones if liver scarring prevents bile from reaching the gallbladder. A damaged liver cannot remove toxins from your blood, causing them to accumulate in your blood and brain. Toxins can dull mental functioning and cause personality changes, coma, or death. Signs of toxin buildup in your brain are neglect of personal appearance, unresponsiveness, forgetfulness, trouble concentrating, or changes in sleep habits. Cirrhosis slows your liver's ability to filter medications from the blood. Because your liver does not remove drugs from the blood at the usual rate, they act longer than expected and build up in your body. This causes you to be more sensitive to medications and its side effects. Normally, the portal vein carries blood from the intestines and spleen to the liver. Cirrhosis can cause portal hypertension when the normal flow of blood through your portal vein is slowed due to scarring on the liver, which increases the pressure inside the vein. When blood flow through your portal vein slows, blood from the intestines and spleen backs up into blood vessels in your stomach and esophagus. These blood vessels may become enlarged because they are not meant to carry a lot of blood. Enlarged blood vessels, called varices, have thin walls and carry high pressure, which can make them more likely to burst. If they do burst, the result is a serious bleeding problem in the upper stomach or esophagus that requires immediate medical attention. Cirrhosis can cause immune system dysfunction, leading to infection. Fluid in your abdomen may become infected with bacteria normally present in the intestines. Cirrhosis can also lead to kidney dysfunction and failure. Does Drinking Alcohol Cause Cirrhosis?